So much of the focus for the last two years has been on acquiring, arranging, planning, moving, and inventorying that sometimes I forget that all of this is temporary. The initial stages of acquiring a large new collection are the precursor to the bigger, longer, indeed permanent stage of their simple existence in the library. By spending my time planning properly now, I can hopefully make their later stage of life a happier and simpler one. 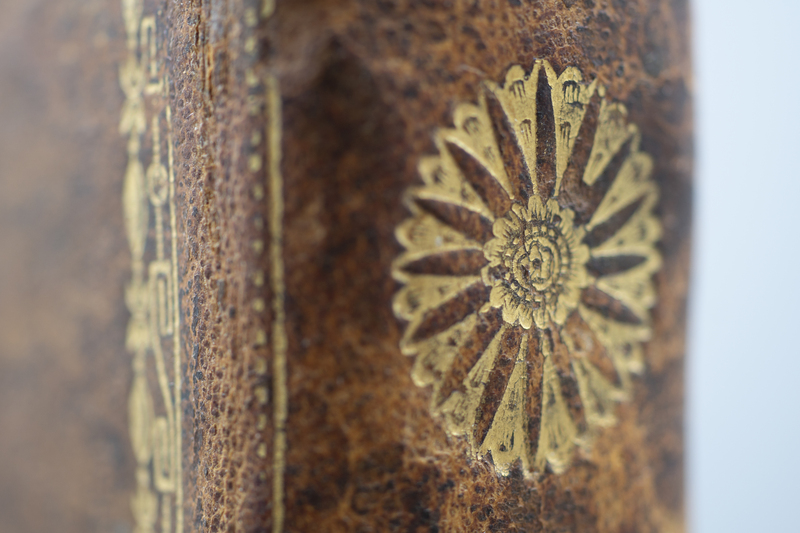 Still, I didn’t anticipate research being done with the new collection for quite some time. So it was an unexpectedly lovely experience to work with Sally for this blog post. We knew we wanted to work with her in some way, but with the collection uncataloged access was going to be tricky. I ended up taking her into the temporary storage area and pointing her to areas I thought were interesting (purely based on aesthetics and age of materials) and she found something that fascinated her right away! I was shocked at how easy it was. 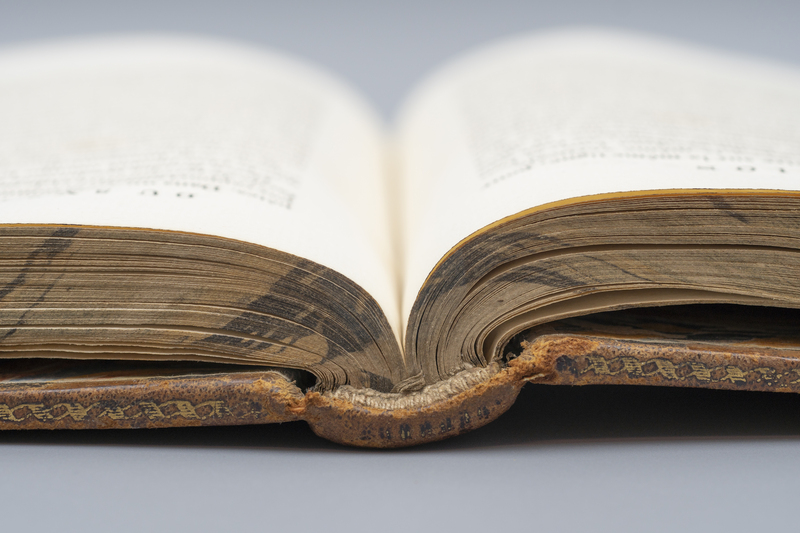 And not only that, the several visits Sally made over the course of doing research for this guest post were an exercise in librarianly delight. So often we think about users en masse or theoretically, but here was a researcher, right at this moment, exclaiming about an item I had worked so diligently on acquiring and moving and giving her access to. It was a jolt of pure professional joy! So I hope you enjoy this blog as much as I do. In the serene quiet of the Niels Bohr Library it seems like a conversation with Pierre-Simon Laplace (1749–1827) --his ideas come off the page as though freshly thought. 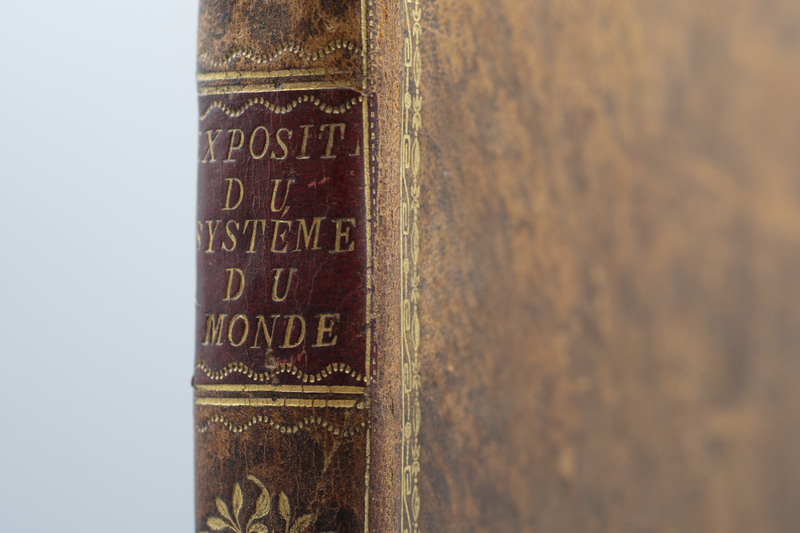 From the Wenner collection of more than 3,800 volumes on the history of physics I was privileged to look at a volume before the books were properly cataloged and accessioned: 1799, Exposition du Systême du Monde, second edition. Like most of the volumes it has been attractively bound, but not as recently as some of the other Wenner books. I don’t know if it is original. 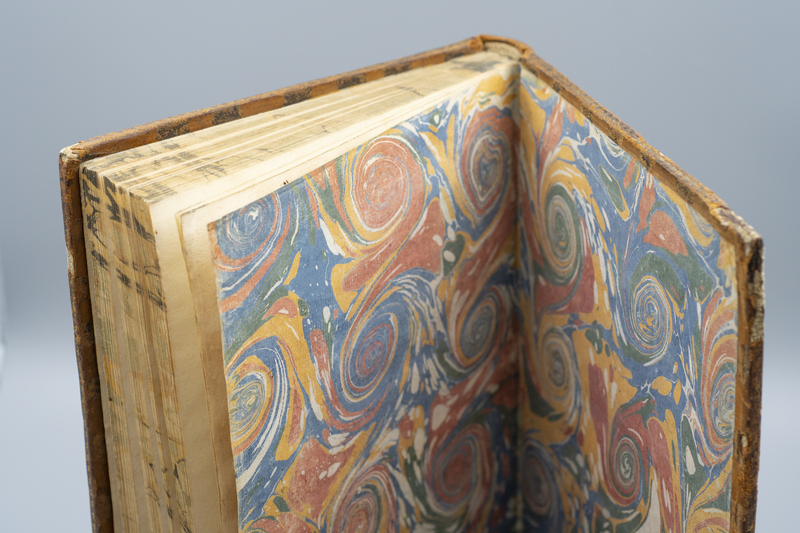 The end sheets are beautifully marbled. The pages are sturdy rag paper, unlike those made of the acid-perfused paper of the early 20th century. Because the content deals with science, the French is easy to read, unlike (for me) newspaper articles or philosophy. 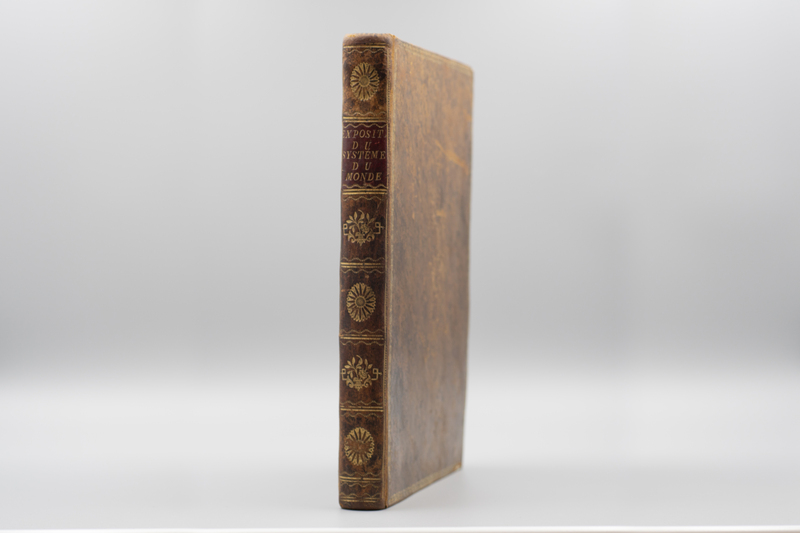 It was also serendipitous that the volume Allison [the Librarian managing the collection] plucked off the shelf is one of Laplace’s most accessible works for a non-mathematician. Gillispie (1997, 169) called it one of the most successful works of science ever composed. 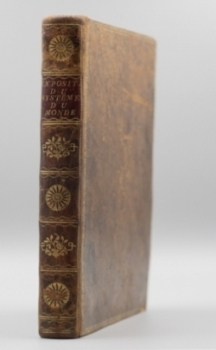 The first edition of Exposition was published in 1796. The Niels Bohr library has an 1813 edition in French, and an 1830 translation into English, with notes. 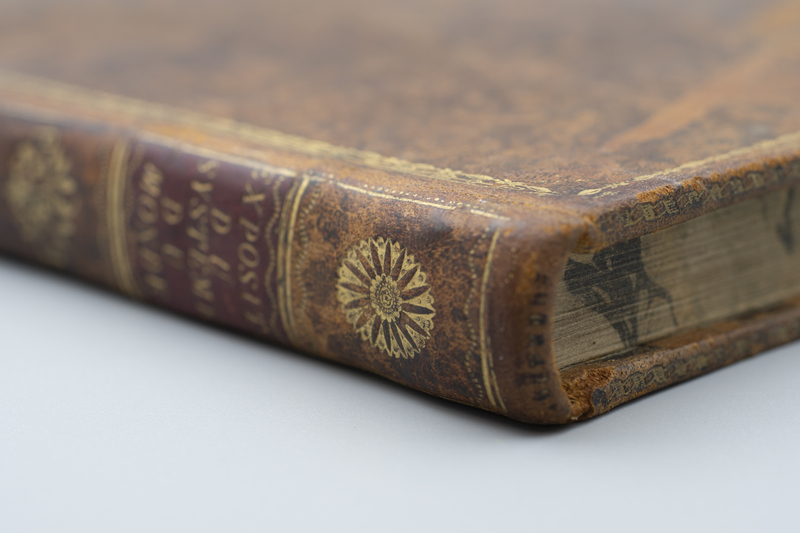 The Wenner collection also includes English translations of the System of the World by Pond in 1809 and Harte in 1830. 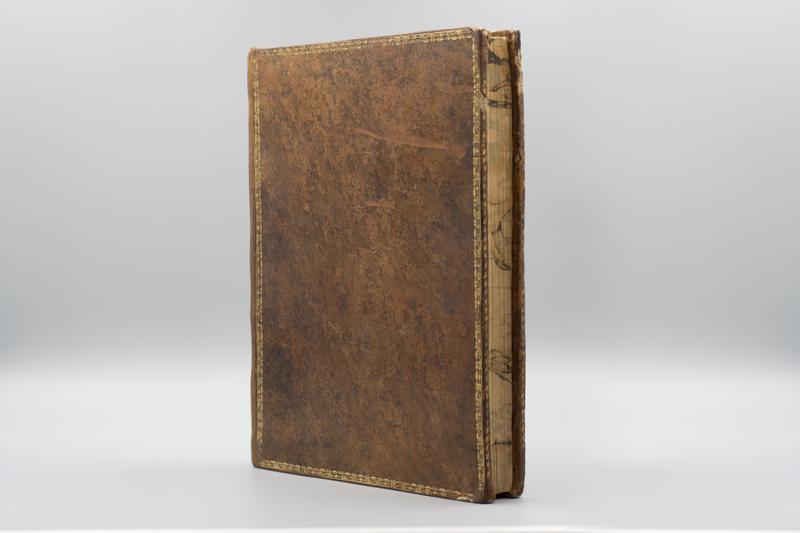 Among other editions and translations, the superb American Philosophical Society Library owns a first edition plus others. Laplace is well known for the Exposition, 1796, the 5 volume Mécanique Céleste, 1799-1825, Théorie Analytique des Probabilités, 1812, and a lifetime of contributions to astronomy and mathematics. The Niels Bohr Library & Archives has various editions and translations of Laplace’s major works including a 1878-1912 version of the complete works, but the Wenner collection brings more complete coverage. LaPlace, Exposition du Systême du Monde, 1813. 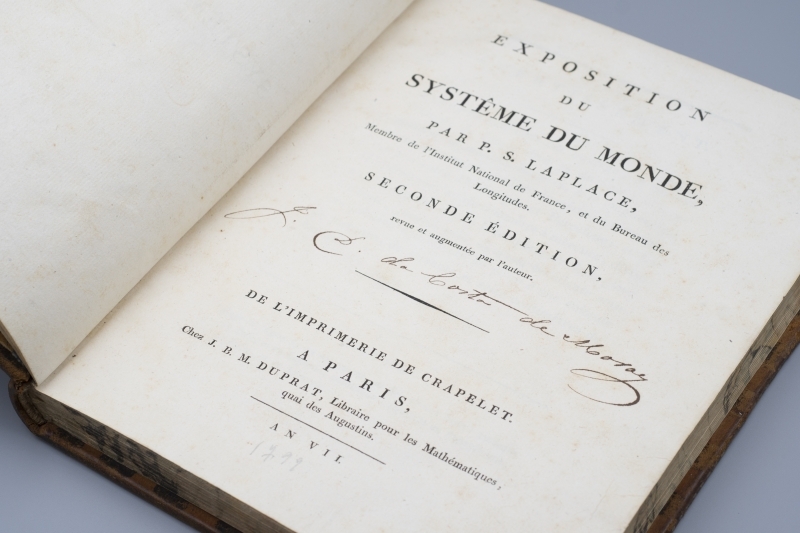 The Exposition was one of several projects Laplace intended for a wider readership than physicists and mathematicians, the notable other being the Essai Philosophique sur les Probabilités.The Exposition has also been called “clearly the most elegant and readable work Laplace ever composed” (Hahn 2005, 112). Among the ideas introduced and discussed are: the new metric system (which Laplace was instrumental in initiating); the possible concept of black holes; and the nebular hypothesis of planet origin. Laplace was one of those working for a uniform, standardized, system of weights and measures in a universal decimal system in the early 1790’s. He incorporated this into the first and following editions of the Exposition. In this second edition it is in Book One, Chapter 12, pp. 53-75. According to Gillispie (1997, 175) in the first edition of the Exposition Laplace conjectured about the effect of a star with a diameter 250 times that of the sun. The gravitational attraction would be so great no light could escape, and so could be invisible, perhaps a hypothesis as precursor to black holes. Both Hahn (pp. 114-119) and Gillispie (pp. 172-175) traced the evolution of Laplace’s conjectures about the origin of the solar system, which led to his version of the nebular hypothesis as an explanation, also in the Exposition. The Gillispie and Hahn books are also in the Niels Bohr Library. Infinitely varied in its effects, nature is simple in its causes, and its economy consists in producing a large number of often very complicated phenomena by means of a small number of general laws. Gillispie, C.C. 1997. Pierre-Simon Laplace 1749-1827 : A Life in Exact Science. Princeton : Princeton University Press. Wenner, D.L. 2018. 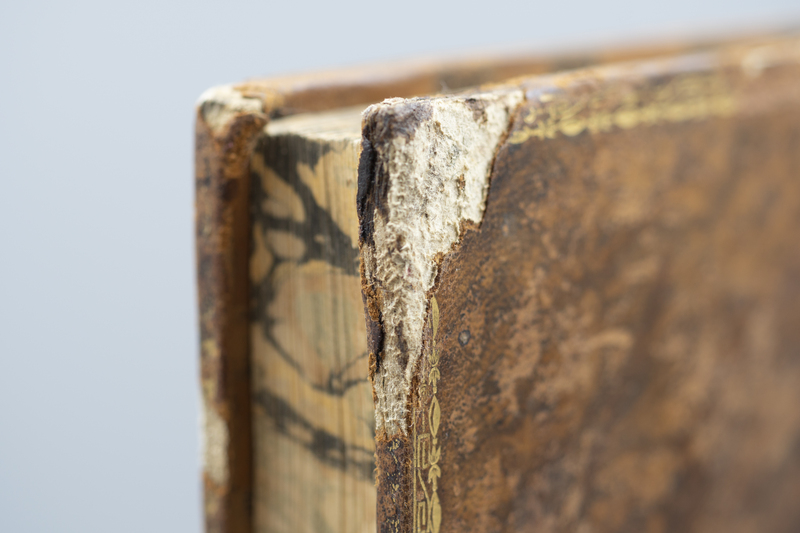 History of Physics: The Wenner Collection. 2nd Edition. Self-published. After raising two excellent children and following her husband overseas several times, Sally Newcomb re-joined the academic world to add to her B.S. in chemistry. This resulted in a master’s degree in geochemistry, and another with the Committee on the History and Philosophy of Science at the University of Maryland. Sally taught inorganic chemistry and physical geology at Prince George’s Community College, but retired to write history of the geosciences full time. This resulted in Special Paper with the Geol. Soc. of America and a number of articles, serving as Chair of her GSA division and co-leading a Pardee session on the history of the ophiolite concept, as well being elected a Fellow of GSA. Sally is currently working on a long paper about early mapping and geological interpretation in mid-18th century America.